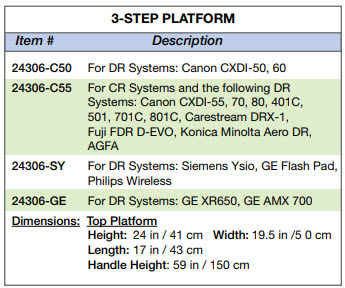 This unique 3-step platform from Clear Image Devices allows for more positioning options. Getting your patients into the best X-ray position possible, without compromising their comfort, requires investing in positioning aids that enhance your imaging equipment's ability to capture a high quality diagnostic X-ray you can use. This unique 3-step platform allows for more positioning options, making positioning in radiography a much easier task. We design a convenient, durable, stable, cleanable, and easily portable , HIGH-QUALITY 2-Step Platform which is now available internationally, contact us at sales@clearimagedevices.com to find a dealer or order direct.